Packaging Equipment Market size was valued at around USD 38 billion in 2017 and will grow at over 3% CAGR from 2018 to 2024. Growing demand for packaged food & beverages due to the rise in urbanization and the middle-class population base is anticipated to drive the packaging equipment market growth over the coming years. Rising awareness about the retention of product quality and sustainable packaging is contributing to the growth of packaging machinery market demand. The packaged food & beverage industry prospects have encouraged companies to adopt these solutions to maintain the quality of their products. The beverage industry has witnessed an increase in demand for rigid packaging solutions such as filling and palletizing machines that aid in packaging beverages in hard plastics or bottles. Increasing awareness regarding food brands owing to advertising by international companies and a rise in the demand for ready-to-eat food coupled with the liberalization of trade in food & agriculture are projected to catapult the packaging equipment market size. The rise in disposable incomes and an increase in the standard of living have augmented the demand for pre-cooked and convenient meals and have stimulated the demand for high-end personal care products. These factors have stimulated the demand for sturdy packaging solutions that help in ensuring the durability and longevity of products during transit. Moreover, the packaging machinery market is witnessing a rise in the adoption of smart technologies. Several smart features provided by the manufacturers are aiding the end users in enhancing the productivity of several processes and operations. Some of the technologies that are experiencing high adoption rates are intelligent packing, IoT technology, and smart sensors. Fully-automatic machines are the most preferred for the packaging of food & beverage and cosmetic products as these help in saving labor cost and time and provide efficient outputs. Fillers in packaging equipment market accounted for over 20% of the industry share in 2017. This equipment is experiencing a high demand in the beverage industry due to the rise in consumption of drinks and juices among consumers. Several types of filling machines (for example gravity-based piston, pump, overflow, and pressure fillers) are being developed and deployed to provide accuracy and reliability in filling the bottles. Companies operating in the beverage industry are installing this machinery in their production facilities to speed up the production process and to gain accuracy in their systems. This has led to manufacturers operating in the packaging machinery market to develop products depending on the type of the liquid that needs to be filled in the bottles. 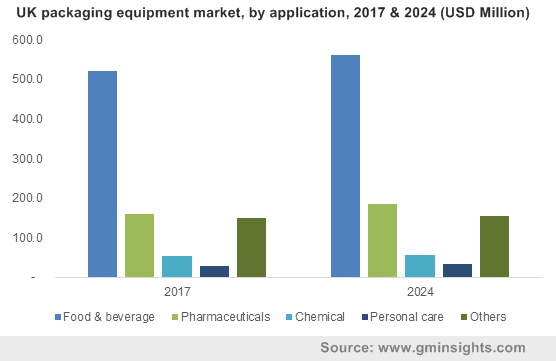 Moreover, cosmetic and personal care products are popular in countries including the U.S. and Canada, encouraging the players to target their products in the region, thereby driving the packaging equipment market growth, particularly for liquid, powder, and bottle fillers. Pharmaceutical drugs require proper packaging to protect them from environmental conditions and to prevent modification of their chemical properties. The pharmaceutical packaging equipment market is characterized by the demand for blister packs, plastic bottles, caps & closures, medical specialty bags, pouches and strip packs, medication tubes, and cartridges. The steady demand from the healthcare/medical sector has led to the consumption of strip packing machines, blister packaging machines, LFA automatic tablet counting machines, fill & sealing machines, vertical tablet packing machinery, bottling & filling lines, and tube fillers. Paperboard packaging is picking up speed due to the rapid growth in the B2C e-commerce space and the growing consumer preferences for online shopping. 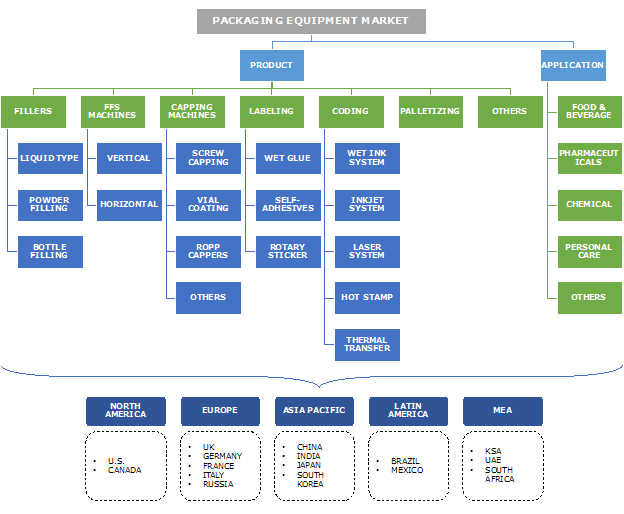 The food & beverage industry is a major contributor to packaging equipment market demand. Changing lifestyles and eating habits, particularly in the younger and working demographic, have resulted in significant demand for ready-to-eat meals over fresh food, spurring industry demand in the sector. In 2017, North America accounted for around 25% of the packaging equipment market share and is growing at a rapid pace owing to the rise in adoption of smart packing solutions in several industrial sectors. Manufacturers are integrating several advanced technologies into these machines to provide remote monitoring & control, mobile connectivity, and other intelligent features. With automation strengthening its foothold in the North America packaging machinery market, food & beverage and pharmaceutical companies are concentrating on integrating advanced software to reduce human interferences. The seamless integration of software and hardware is allowing manufacturing industries to produce robust and accurate products, lower accident rates, and reduce wastage in an economically profitable method. Moreover, high standards of living and stable economic conditions in the region are surging the demand for high-performance machinery. Key players operating in the packaging equipment market are Aetna Group, Adelphi Packaging Machinery, B&H Labelling Systems, Bosch Packaging Machinery, Barry-Wehmiller Companies, Inc., CKD Group, Bradman Lake Group, Fuji Machinery Company, Coesia Spa, Harland Machine Systems Ltd., Krones Group, Illinois Tool Works, and GEA Group, among others. Several companies are replacing the legacy equipment with advanced automated machinery, thereby providing an impetus to the packaging equipment market growth. Manufacturers are integrating advanced software to monitor and control the packing cycle. Rising consumer demand for enhanced quality and sustainability of end products is encouraging companies to invest in innovative technologies. Robotic systems are increasingly being deployed in the pharmaceutical, personal care, and chemical factories. These systems enhance operations and maintain the optimum quality of the packaged goods. Technological advancements and an increasing number of chemical and pharmaceutical players are driving the packaging equipment market. The adoption of automated packing machines provides several advantages to the industrial players such as versatility, safety, lesser maintenance, accuracy, enhanced productivity, specialized packing, and efficiency. Increase in labor costs and technicians for operating and managing the packaging process is encouraging the industries to adopt several types of machines for simplifying operations. Regulatory directives governing the materials that should be used in packaging have led to a paradigm shift toward environmentally-friendly development techniques and products. Strategic initiatives are being implemented by several players to build a strong supplier and dealer base to increase the customer reach. The companies operating in the packaging machinery market are heavily investing in research and development to manufacture products with higher efficiency and productivity.